The global cell and tissue technology market is expected to grow at the CAGR of 6.56% during 2016-2022. The market has generated revenue more than $19 billion in 2016 and is projected to reach up to $30 billion by 2022. Due to increasing chronic cases and inferior’s diseases, increasing health industry, increasing advanced technology products and increasing government and private funding for cell based research act as the major factors which increase the market of cell and tissue technology globally. The key drivers which accelerate the market are rising cancer cases. According to World Health Organization, the cancer rate is increasing to reach to 15 million new cases by 2020. According to WHO report, more than 1.2 million new cases are diagnosed for lung cancer worldwide, one million new cases of breast, 870000 cases of stomach, 560000 cases of cervical, 410000 cases of head and neck cancer and many more. Due to these cases, the demand of cell and tissue technology has increased. The cell and tissue technology is segmented on the basis of product, process and end users. On the basis of product, the market is segmented as consumables and instruments. The consumable is further sub segmented in to reagents, assay kits, microplates and other consumables. The instruments are further segmented as microscopes, flow cytometry, spectrophotometers, QPCR, cell counters, high-content screening (HCS) systems and cell microarrays. The microscopes are further sub segmented in to electron microscopes, inverted microscopes, stereo microscopes, fluorescence and confocal microscopes, phase contrast microscopes, near-field scanning optical microscopes (NSOM), and other microscopes. The flow cytometer is further sub segmented as flow cytometer instruments and flow cytometer software. The spectrophotometer is further sub segmented as fluorescence micro plate readers, colorimeters, micro plate spectrophotometer. The cell counters is further sub segmented as automated cell counters and hem cytometers and manual cell counters. The high-content screening (HCS) systems are further sub segmented as cell imaging and technology HCS systems and HCS software. On the basis of process, the market is further segmented as cell signaling pathways/signal transduction, cell proliferation, cell number counting and quality control, cell interaction, cell structure study, target identification and validation and single-cell technology. On the basis of end users, the market is further segmented as hospitals and academic & research institutes, laboratories, contract research organizations (CROS) and pharmaceutical & biotechnology companies, cell culture collection repositories and other end users. 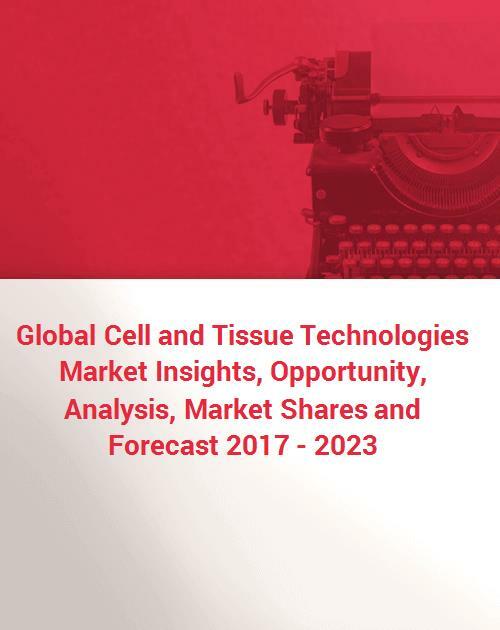 Geographically, the cell and tissue technology market is divided into North America, Europe, Asia Pacific, and Rest of the World. North America has the largest market share of cell and tissue technology followed by Europe and Asia Pacific. The APAC regions have a trend of developing market and various opportunities of growth in China, Japan, Australia, and India and are likely to have huge investments for new investors in the cell and tissue technology market. Drug discovery services outsourcing and government aided funding for novel screening technologies has resulted in growth of Asian markets. Some of the major market players are Agilent Technologies, Inc., Becton, Dickinson and Company, Bio-Rad Laboratories, Danaher Corporation, Fluidigm Corporation, GE Healthcare, Merck KGAA, Nanostring Technologies, Inc., Olympus Corporation, Perkinelmer, Inc., Promega Corporation, Qiagen N.V., Sigma Aldrich Corporation, Tecan Group Ltd., Thermo Fisher Scientific, Inc. etc. Acquisition, mergers and expansions are the key strategies adopted by the market players to sustain in the market. For example, in November 2015, Agilent Technologies announced the completion of acquisition of Seahorse Bioscience, a leader in providing instruments and assay gears for measuring cell metabolism and bioenergetics. Similarly, in august 2015, Danaher Corporation declared the completion of acquisition of Pall Corporation, a New York based company, and a global supplier of filtration, separations and purification products. 15. Thermo Fisher Scientific, Inc.